RLPB 425. September Update, Incl. Nigeria, Iraq, CAR, Egypt, Kenya, Pakistan, Philippines, Turkey. * NIGERIA (RLPB 422), where a coalition of Northern Muslim youth groups issued a chilling ultimatum in Kaduna on June 6. The 'Kaduna Declaration' gave the Igbo (the mostly Christian Africans indigenous to Nigeria's south-east) a deadline of 1 October (Nigerian Independence Day) to leave the North, after which time they would be forcibly ejected. Subsequently, anti-Igbo hate speech has proliferated across the north, sending ethnic-religious tensions soaring. Religious Liberty Monitoring 6 July 2017. UPDATE: In early September the government of President Muhammadu Buhari launched Operation Python Dance 2 and sent military forces into Umuhia, the capital of Abia state, to arrest IPOB leader Nnamdi Kanu. [IPOB (Indigenous People of Biafra) advocates for the independence of Biafra/Eastern Nigeria. It is not a militant group and does not have an armed wing.] On 12 September tanks and other armoured vehicles descended on Kanu's home, triggering protests from horrified IPOB supporters. Clashes ensued, resulting in numerous deaths. Video footage posted to social media showed Nigerian soldiers beating, torturing and killing unarmed Igbo. This in turn triggered ethnic-religious skirmishes in other cities in neighbouring states as Igbo sought revenge. JOS: On 14 September the cycle of violence escalated further as Hausa-Fulani Muslims attacked Igbo traders in Jos, capital of the volatile Middle Belt state of Plateau. At least three Igbo were killed (including two known Christians) and several injured before the police managed to calm the situation. Security was strengthened at churches on Sunday 17 September to prevent further attacks. SOKOTO: On 17 September a mob of some hundreds of Muslim youths attacked Igbo traders in Sokoto, the capital of Sokoto State in Nigeria's far north-west. The Igbo fled for their lives as their properties were looted and torched. BLAME THE VICTIM: The government subsequently proscribed IPOB as a terrorist organisation, rendering anyone who participates in the group's activities liable to a jail term of 20 years. 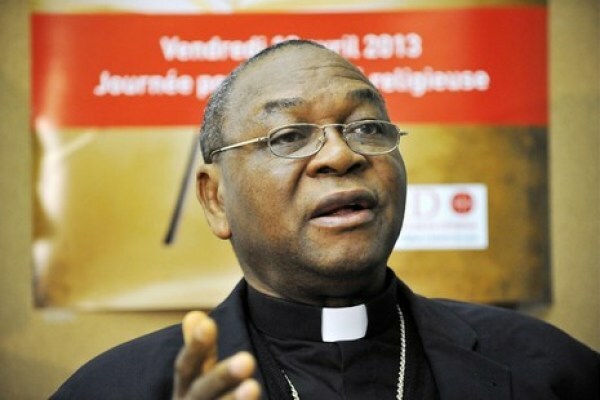 Catholic Cardinal John Onaiyekan slammed the move noting: 'The title of terrorists should not just be thrown at anybody. And there is a danger that if we continue this way, it may become more and more difficult for us to arrive at a peaceful solution.' He wondered why IPOB had been deemed terrorists while the Fulani herdsmen 'who are armed, lethal, murderous, vicious and have been killing people in our communities' were not. Operation Python Dance 2 -- which one commentator has likened to 'killing a fly with a sledgehammer' -- is ongoing in five south-eastern states. The situation in Nigeria is absolutely dire. 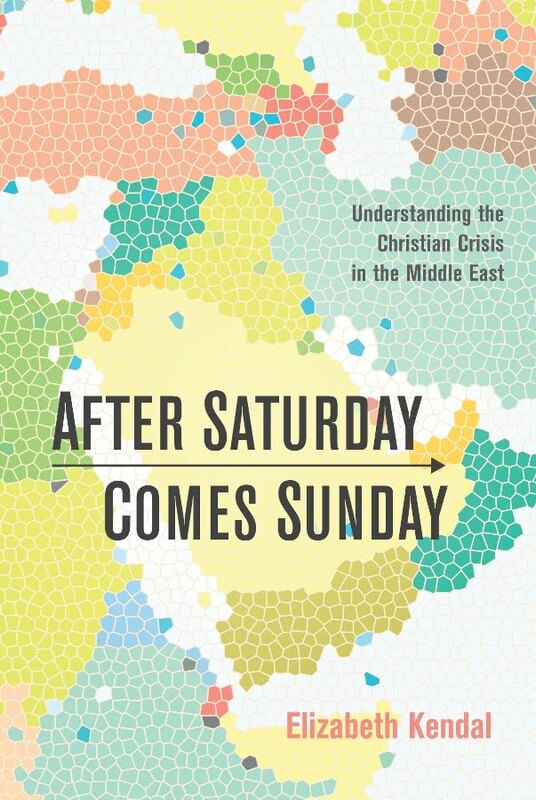 The stage has been set for a serious ethno-religious crisis. Please pray! May the Lord protect and preserve his precious people. * NORTH KOREA (RLPB 423), as the leaders of North Korea and the USA continue to ramp up the war rhetoric. Please pray for God to intervene to the benefit of his beloved Korean/Chosun people -- in particular, his long-suffering persecuted remnant Church in the North. * IRAQ (RLPB 424), ahead of the highly controversial 25 September Kurdish referendum on independence. Religious Liberty Monitoring, 19 Sept 2017. The Kurds came out in force on 25 September to vote overwhelmingly for Kurdish independence. Tensions are soaring, both inside Iraq and across the region. Baghdad is threatening to ban flights into Iraqi Kurdistan, while Turkey and Iran are threatening sanctions and border closures -- all moves designed to starve and strangle Iraqi Kurdistan into submission. Furthermore, the referendum has inflamed Kurdish independence zeal, but the result is not binding and the masses will not get what they voted for. President Massoud Barzani of the Kurdish Regional Government (KRG) may well have started something he will have no chance of controlling. Caught in the middle of this new crisis is Iraq's already traumatised and largely displaced, remnant Assyrian Christian nation. Please pray! * AFGHANISTAN: As noted in RLPB 424 an unnamed Finnish aid worker abducted from a Kabul guesthouse on 20 May [RLPB 409 (31 May)] was released on 14 September. No further details are available and no-one has claimed responsibility for her abduction. We praise God for this mercy and continue to pray for the gravely imperilled, 'underground' Afghan Church. Pray also for the Afghan diaspora (in your own country and across the world), amongst whom the Afghan Church is growing. On 1 September dozens of Islamic militants from Sudan invaded Zemio town in CAR's south-east. They looted and ransacked the Catholic Church compound, forcing the 15,000 people sheltering there to flee across the border into the Democratic Republic of Congo. The attack was allegedly perpetrated in the presence of UN troops believed to be from Morocco. Doctors Without Borders (MSF) laments that Zemio has become a 'ghost town' of looted shops and burnt houses. The population has dropped from 21,000 to under 1,000, the only people left being 'those who could not run away -- the elderly and the disabled'. On 2 September, at a farm in Zambaguia village on the outskirts of Zemio, Father Louis Tongagnesi was hacked to death by Islamic militants believed to be from the Fulani-dominated and ironically named Union for Peace in the Central African Republic (UPC). 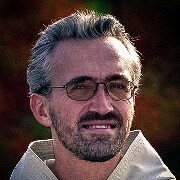 On 3 September Father Robert Wieczorek, a Polish missionary who has been serving in CAR for more than 20 years, was kidnapped by Islamic militants who attacked his parish in the north-western town of Ndim. He was tortured but released alive. Wounded and having lost a lot of blood, he was hospitalised for treatment. The female mayor of Ndim was also kidnapped, tortured and released. The attack has been attributed to the Patriotic Movement for the Central African Republic (MPC), although they deny it. Pray for the Church in CAR. On 26 May (Ascension Day) 28 Coptic Christians were massacred and some 23 wounded in Minya Governorate when their bus was ambushed by Islamic jihadists while en route to the Monastery of St Samuel the Confessor [RLPB 409 (31 May)]. In the wake of the terror, Bassem Abdel-Malak Fahim (25), a Copt from the village of Ezbat El-Sheikh Nageim, Minya Governorate, expressed his frustration on Facebook. Bassem accused Islamic leaders of inciting the killings and criticised the Egyptian government for failing to crack down on Islamic militants within Egypt's borders. He later deleted the post, but not before it had been shared by his friend Younan Samuel (25). On 6 September some Muslims in his village discovered the post. Feigning 'offence' they shared the post widely and incited Muslim rage against the Copts. Tensions soared. On 7 September Bassem and his father visited local Islamic leaders to whom they apologised and explained that no offence was intended. Tensions eased. However, late on 14 September, after security officials withdrew, a mob formed and attacked the Christians, hurling bricks, smashing windows, looting homes and destroying property. Security forces returned and restored calm; however, Bassem and Younan are now facing charges of inciting sectarian strife and insulting Islamic leaders. It is so much easier to blame the victim. The result however is gross injustice and deadly dangerous impunity. Please pray. World Watch Monitor (WWM) has published a really significant article on one of the most serious issues confronting Egypt's Copts. Entitled, 'Egypt: ex-kidnapper admits "they get paid for every Coptic Christian girl they bring in" ' (published 14 September 2017), the article is built around an interview with an Egyptian former Muslim and former trafficker. His personal testimony gives credence to the oft-repeated claim that Salafi Muslims across the region are running a highly organised and well funded campaign to traffic Coptic Christian girls. While the crime is shameful, so too is the international silence that shrouds it, coming from the West's tacit surrender to the Islamic paradigm that criticism of Muslims is not allowed. At around 3am on 6 September some 30 heavily armed Islamic al-Shabaab militants entered Bobo village in Lamu County, accompanied by a number of local Kiswahili speakers. Dressed in military gear and armed with AK-47 rifles, they surrounded the homes of known Christians before calling them out by name. Sources explained to Morning Star News that the militants had previously abducted men from Bobo area and forced them to reveal the names of Christians. Hillary Njuguna, one of the Christians abducted, was killed. Upon hearing their names, three Christians -- Guchu Peter, Jared Maiko and Jospeh Kinuthia -- emerged, only to be seized by militants who then slit their throats. [According to Coast Regional Police Chief Larry Kieng the men were shot and then decapitated.] Terrified families fled into the bush. On Wednesday morning locals burned tyres on the roads to protest the lack of security. Please Pray. On 30 August Sharoon Masih (17) was on his second day at high school in Vehari, Punjab, when he was beaten and killed by Raza Ahmed, a well-built Muslim student with a reputation for fighting and bullying. A classmate who attempted to intervene was also beaten. 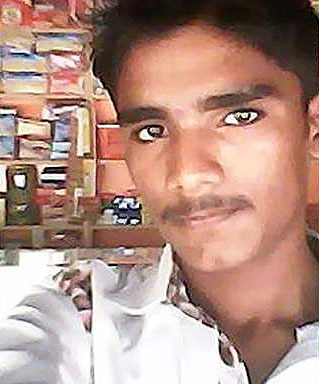 The teacher, Nazeer Ahmed (who had slapped and abused Sharoon in front of the class) was absent from the classroom at the time of the fatal assault. The family is absolutely convinced their son was targeted simply for being a Christian. On 14 September Nadeem James, a young Christian father of two, was sentenced to death for blasphemy. The court found Nadeem guilty of sending a blasphemous poem using the WhatsApp instant messaging service, despite him being uneducated and illiterate. Nadeem was arrested in July 2016 in Gujrat District on the complaint of former friend, Yasir Bashir, who is suspected of sending the poem to himself using Nadeem's phone. Nadeem's brother, Shahbaz James told Morning Star News that the police only charged Nadeem because Islamic leaders had threatened to protest if they did not. Similarly, security concerns meant the trial had to be held inside the jail. The family has been forced to flee their home. The judgement will be appealed. Pray for the Church in Pakistan. As noted in RLPB 424, Philippine soldiers have regained control of the Bato mosque, one of the last jihadist strongholds in Marawi city, rescuing hostages Father Suganob (51) and Mr Acopio (29) in the process. Since then, three more hostages have been rescued. Some 40 hostages are still being held by some 60 to 80 jihadists, ten of whom are foreigners. 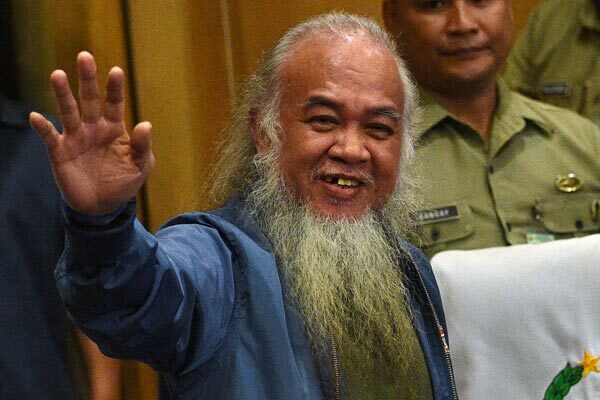 Captain Arnel Carandang comments the jihadists are well trained, well directed and well armed with high-powered weapons, night vision goggles, the latest sniper scopes and surveillance drones. Not only has he seen many foreigners amongst the dead jihadis, but 'We have been hearing in their transmissions some English speaking terrorists.' The military expects the operation to be over by the end of October. Please pray. HOSTAGES: According to Father Suganob, the hostages are a mix of local Christians and tribal people. To its credit, the Philippine army is doing everything in its power to protect and preserve the lives of the hostages. However, transmission intercepts indicate that the jihadists will not surrender, but are planning for a bloody final stand involving suicide bombings. The situation of the hostages is dire. Please pray! May the Lord of Hosts deploy his angels to rescue the remaining hostages. ALSO: The military and police are closely monitoring Bayang town on the south side of Lake Lanao (opposite Marawi), after black-clad armed men stormed into the area on Wednesday 20 September and fired on a military detachment there. A fire-fight ensued and all is now calm. Pray for the Philippines! May all Filipinos come to enjoy peace, justice, fairness, security and liberty. Children in Turkey started their new school year on 18 September with a new curriculum. There is less science, less Ataturk (Turkey's secularist founding father) and more Islam, including jihad. Defined as 'religious war' by the dictionary of the Institute of Turkish Language, 'jihad' will be taught as an Islamic value and integral element of Islamic law. One teachers' union expressed fears the new curriculum would encourage a 'religious and nationalist' mindset. 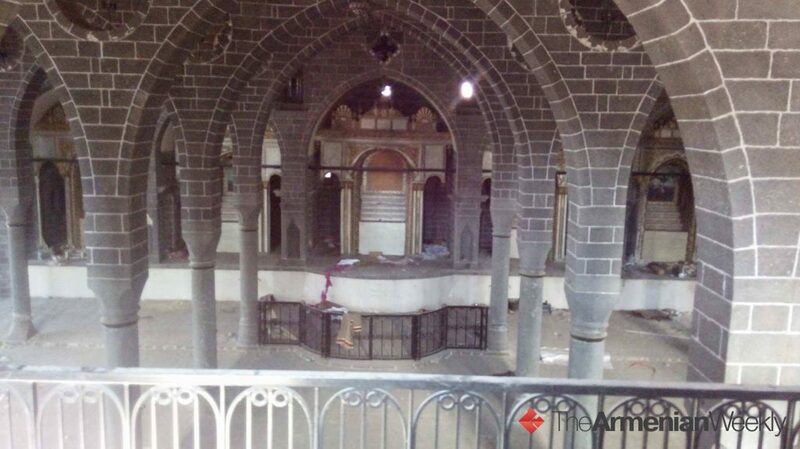 It should be unsurprising, therefore, that photos secretly taken inside Diyarbakir's Surp Giragos Armenian Apostolic Church 18 months after the government seized it reveal an empty desecrated shell. First built in the 1600s, Surp Giragos had been closed in the 1960s but then renovated with the support of the Armenian diaspora and the Sur municipality before a grand reopening in 2011. The church -- the largest Armenian cathedral in the Middle East -- was seized in March 2016 by a government that has no interest in its survival [see: RLPB 355 (4 May 2016)]. Pray for the Church in Turkey. Elizabeth Kendal is an international religious liberty analyst and advocate. She serves as Director of Advocacy at Canberra-based Christian Faith and Freedom (CFF), and is an Adjunct Research Fellow at the Arthur Jeffery Centre for the Study of Islam at Melbourne School of Theology. 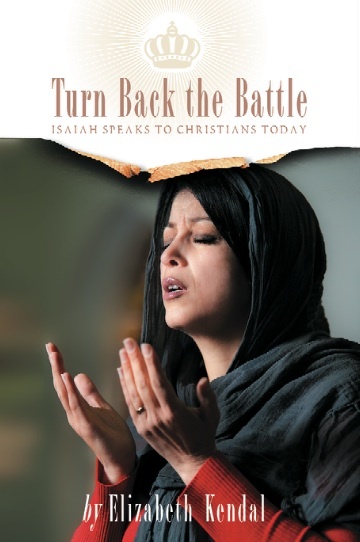 She has authored two books: Turn Back the Battle: Isaiah Speaks to Christians Today (Deror Books, Melbourne, Australia, Dec 2012) which offers a Biblical response to persecution and existential threat; and, After Saturday Comes Sunday: Understanding the Christian Crisis in the Middle East (Wipf and Stock, Eugene, OR, USA, June 2016). Assyrians are the indigenous people of Northern Iraq and a Christian nation. Between June and August 2014, ISIS drove more than 130,000 Assyrians from their homes in Mosul and the Nineveh Plains. Traumatised and destitute, most found refuge in Iraqi Kurdistan, primarily in Dohuk (to the north) and Erbil, the Kurdish capital (to the east). This year, a coalition led by the Iraqi Army and aided by Popular Mobilisation Units (PMUs: mostly Iranian-led Shi'ite militias), US-backed Kurdish peshmerger forces and Assyrian units have succeeded in liberating Mosul and much of the Nineveh Plains. As Assyrians tentatively trickle back into their towns and villages, they do so with the hope that the Nineveh Plains might one day be an autonomous entity within the state of Iraq. The last thing they want is to fall victim to a Kurdish land grab, or to find themselves caught in the middle of another war. Unless there is a miracle, the Kurdish Regional Government (KRG) will hold a referendum on independence on Monday 25 September. Though the anticipated 'Yes' vote will not trigger an automatic declaration of independence, it is expected to lead to official negotiations. 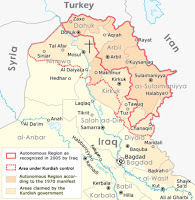 Analysts suspect that KRG President Massoud Barzani's goal is not independence, but leverage to aid negotiations over revenue sharing (more money), further devolution of power (more power) and the demarcation of Iraqi Kurdistan's borders (more land). However, as Iraqi Prime Minister Haider al-Abadi commented on 16 September, the Kurds are 'playing with fire'. is marked with a Cross. Talk of Kurdish independence has sent tensions soaring inside Iraq and across the region. 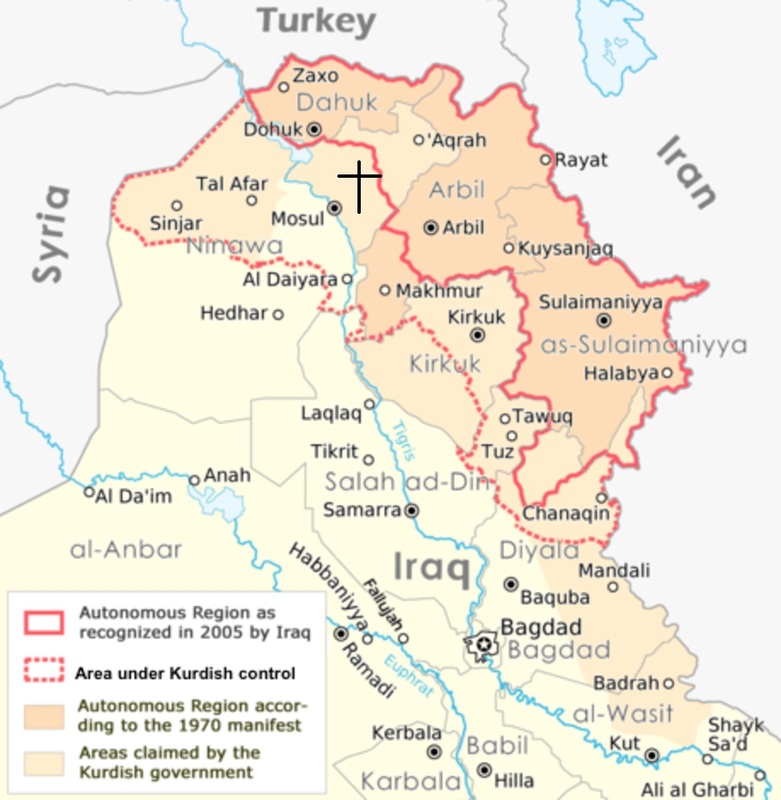 Eager to expand its borders, the KRG aims to include 'disputed territories' in the referendum, including oil-rich Kirkuk and the Nineveh Plains. Despite pressure from Kurd and pro-Kurd authorities, most Assyrians oppose the referendum and do not want their lands included. Fearing Shi'ite power, Nineveh's Sunni Arabs support Kurdish independence and do want to be included. In a move destined to destabilise the whole region, oil-rich Kirkuk (controlled by Baghdad until Kurdish forces seized it in the chaos of August 2014) will participate. The Iraqi Government, Iran and the Shi'ite militias oppose the referendum, the break-up of Iraq and Kurdish annexation of Kirkuk. Meanwhile, Turkey, Iran and Syria oppose the referendum as it could embolden their own restive Kurdish minorities. The pro-Kurdish US is opposed to the referendum as it will weaken Iraqi Prime Minister Haider al-Abadi to the benefit of Iran ahead of the April 2018 general elections. Many Kurds too are opposed to the referendum because they sense this is simply not the right time for such a provocative move. Aware that the referendum could trigger a new conflict, Turkey, Iran, the US and the UN have been lobbying KRG President Massoud Barzani to cancel or postpone the referendum indefinitely, to no avail. On Sunday 17 September the KRG's High Referendum Council, headed by Barzani, voted to reject the US-backed alternative and press ahead with the 25 September referendum as planned. * intervene in Iraq for the benefit of his precious long-suffering people; may peace reign and the highly controversial and provocative referendum on Kurdish independence be indefinitely postponed; may 'courageous dialogue' be the order of the day. Update -- Afghanistan: The unnamed Finnish aid worker taken hostage in Kabul in May [see RLPB 409 (31 May)] was released on 14 September. Update -- Philippines: Late on 16 September Philippine soldiers overran Marawi's Bato mosque, clearing its many tunnels and secret chambers and rescuing two hostages: Father Teresito 'Chito' Suganob (51) and a male school teacher surnamed Acopio (29). The jihadists still hold around 40 mostly Christian hostages [see RLPB 421 (30 Aug)]. Please continue to pray. Between June and August 2014, some 130,000 Assyrian Christians were driven from their homes in Mosul and the Nineveh Plains by ISIS. Most found refuge in Iraqi Kurdistan. Now as their lands are liberated, Assyrians are trickling back into their towns and villages. However, talk of Kurdish independence has sent tensions soaring. 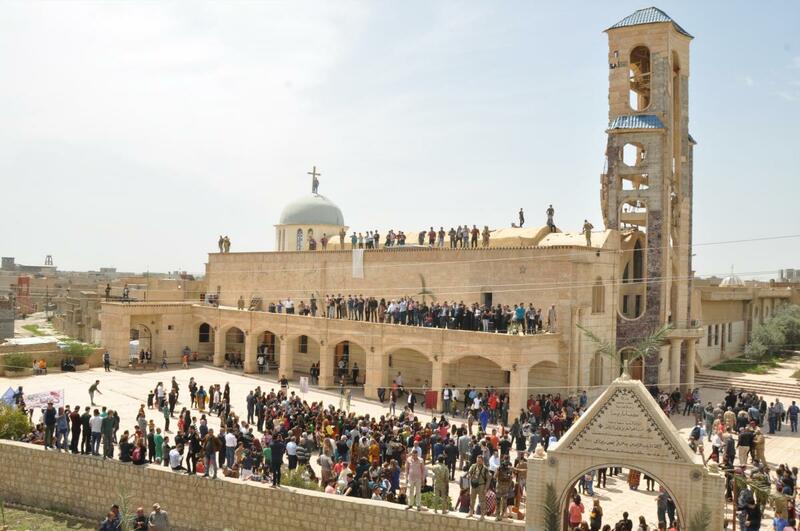 Christians fear the Kurds will seize the Assyrian heartland of the Nineveh Plains. The Iraqi Government, Turkey, Iran and essentially all Shi'ites have vowed to stop the Kurds annexing oil-rich Kirkuk. Chaldean Patriarch Louis Raphael Sako's urgent appeal is for 'courageous dialogue'. Lamenting that 'some have already started beating the war drums', he appeals for peace, noting war would be 'disastrous', especially for minorities who, as usual, would 'pay a high price'. Please pray for Iraq and its Christians. Sanctions will not work, but neither can there be a military solution for as the US Defense Department and everyone in the region knows, the cost to South Korea -- in lives and infrastructure -- would be absolutely catastrophic. Though war is not an option, on Sunday 10 September US Senator John McCain called for Washington to ratchet up the pressure by stepping up its presence in the region to 'make sure that Kim Jong-un knows that if he acts in an aggressive fashion, the price will be extinction.' Such language would surely cause considerable distress to millions of Christians around the world who don't want to see North Korea's long-suffering remnant Church obliterated in US 'fire and fury'. If sanctions are not the solution and war is out of the question, what are we left with? It leaves us with the possibility of returning to six-party talks (North Korea, South Korea, Japan, China, Russia and the USA). Ultimately, what the Kim regime wants is a bi-lateral treaty with the USA: one that recognises North Korea as a nuclear power, taking regime change off the table. North Korea also wants to be recognised as a sovereign independent state, taking reunification off the table (at least for the foreseeable future). Some analysts insist the crisis (most of which is theatre and posturing) is approaching its 'end game' and that resolution and dialogue, not war, will be the outcome. That said, the situation remains incredibly volatile -- an angry or accidental slip could jeopardise everything. Should a resolution be reached, South Korea, China and Russia (i.e. 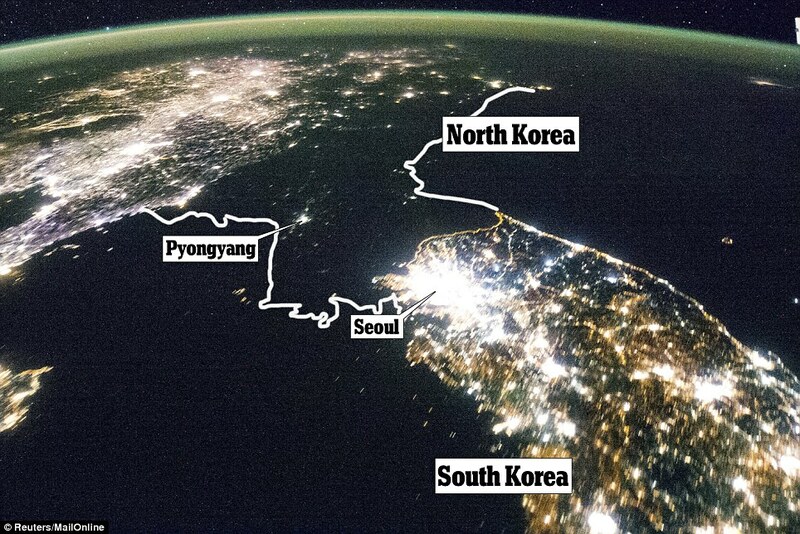 North Korea's neighbours) are ready to invest in such a way as to facilitate North Korea's economic development. This is critical, for North Korea cannot truly open up to the world until it has radically improved the living standards of its people. Hence the endless balancing act: when risk is perceived to be high, repression and belligerence are extreme; however, when risk is perceived to be low, engagement and reform inch tentatively forward. There really is no alternative to returning to the days of inching forward. South Korea's new President Moon Jae-in, whose parents fled the north during the Korean War, is eager to re-establish dialogue and co-operation, as are Russia and China. However, the Kim regime will not negotiate until the US concedes that North Korea is indeed a nuclear power (hence the endless missile tests). Even if talks resume, treaties are signed and normalisation occurs, it will be many years before North Korea can truly open up to the outside world without risking collapse. What is more important though is that conditions inside North Korea improve, including the issue of religious freedom for the long-suffering North Korean Church. * preserve, protect, bless and strengthen the long-suffering North Korean Church – both the Church in the labour camps and the Church deep 'underground'. * intervene in the Korean crisis creatively, according to his wisdom, to fulfil his good purposes, that ultimately North Korea's faithful remnant Church might be liberated to worship freely, to be salt and light and yeast in society, and to bring healing to the North. CHINA UPDATE: It has been confirmed that Christian human rights lawyer Gao Zhisheng, who had been reported 'missing' [RLPB 421 (30 Aug)], is in police custody in Beijing. Analysts expect he will remain in custody until after the week-long Chinese Communist Party's 19th Congress, which commences on 18 October. YEMEN UPDATE: Father Tom Uzhunnalil, kidnapped by jihadists in Yemen in March 2016 [see RLPB 386 (27 July 2016)], was released from captivity on 12 September, after the Indian and Omani governments secured his release. He is currently in Rome, where he will spend a few days before returning to his home in Kerala, India. Praise God for this mercy. North Korea will not abandon its nuclear weapons program. Sanctions will not work and a military solution is untenable as the impact on South Korea would be catastrophic. The only option is dialogue. However, the Kim regime will not negotiate until the US concedes that North Korea is a nuclear power. The regime maintains that nuclear deterrence is essential if North Korea is to be spared US-backed regime change. Many analysts believe the crisis is approaching its 'end game' and that dialogue, not war, will be the outcome. Whilst it would be many years before North Korea could open up to the outside world without risking collapse, the situation inside North Korea could improve considerably over time. 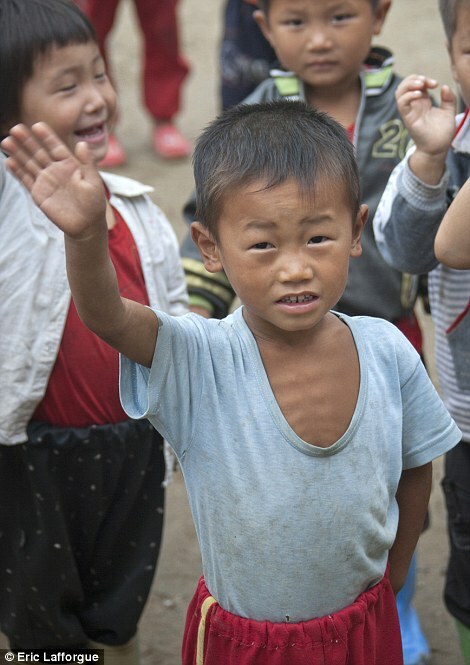 Please pray for North Korea and its long-suffering Church in the labour camps and 'underground'. BACKGROUND: Initially, the British colonialists who arrived in Nigeria in the late 19th and early 20th centuries favoured the northern Hausa and Fulani Muslims, describing them as fair-skinned, fine featured, organised and civilised. Like the northern Muslims, the British viewed the southern Yoruba (in the West) and Igbo (in the East) as black savages, fit for little more than slavery. However, whereas the northern Hausa and Fulani Muslims resisted all things British, the southern Yoruba and Igbo embraced British education and Christianity. At independence (1960) more than a million educated and mostly Christian Igbos were living in the Muslim north, dominating administration and business. Needless to say, the Hausa-Fulani Muslims were not impressed. After the 29 July 1966 Hausa-led military coup, a campaign of ethnic cleansing targeting the Igbo was unleashed across the North in which some 30,000 Igbo were killed and a further 1.3 million were forced to flee. It was not the first anti-Igbo pogrom to hit the North, but it was the worst, leaving the Igbo convinced they had no future in a Hausa-Fulani dominated Nigeria. 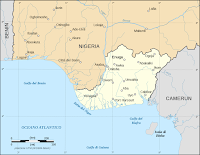 On 30 May 1967 the Military Governor of Eastern Nigeria, Lt-Colonel Chukwuemeka Odumegwu-Ojukwu announced that the region formerly known as Eastern Nigeria would from now on be known as the independent, sovereign Republic of Biafra. 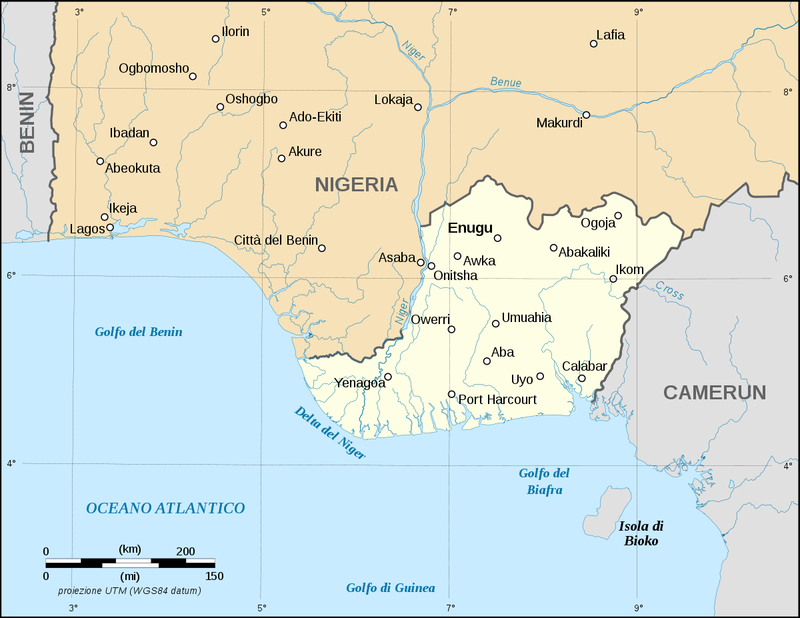 Considering oil had been discovered in Eastern Nigeria's Niger Delta in 1956, it is unsurprising the rest of Nigeria did not approve the secession. The resulting Nigerian Civil War (1967-1970) -- also known as the Biafra War -- claimed the lives of some 100,000 mostly Muslim Nigerian military personnel and between 500,000 and two million mostly Christian Igbo civilians, most of whom perished from starvation during the Nigerian military junta's blockade of Biafra. 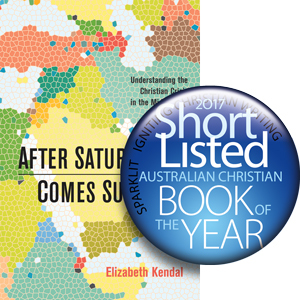 By Elizabeth Kendal, Religious Liberty Monitoring, 6 July 2017. Though the federal government vowed to arrest those responsible for the Kaduna Declaration, no arrests have been made, allegedly on the grounds that it could jeopardise Nigeria's fragile security, i.e., it could trigger widespread Muslim rioting. Nigerian leaders, including President Buhari, have expressed concern over the growing amount of hate speech, noting that the same phenomenon occurred in Rwanda before the 1994 genocide there. At a press briefing in the capital Abuja on 24 August, the spokesperson for the coalition of northern Muslim youth groups, AbdulAziz Suleiman, 'suspended' the group's 6 June quit notice and affirmed the unity of Nigeria while continuing to vilify the Igbo. On Sunday 3 September Nigeria's top Muslim spiritual leader, Sa'ad Abubakar condemned the Kaduna Declaration, openly declaring his opposition to it. Yet, despite all efforts to calm the situation, Muslim youths across the North continue to 'beat the drums of war' and insist all Igbo must leave before 1 October. A group of UN experts has expressed 'grave concern' about the possibility of ethnic bloodshed, 'especially considering the previous history of such violence'. Few doubt that a crisis is looming and that efforts to defuse it have been half-hearted at best. * intervene in Nigeria to calm the brewing storm; may the whole Nigerian Church unite in prayer -- nationwide, across denominational and ethnic lines -- to petition the Lord for peace and mercy. 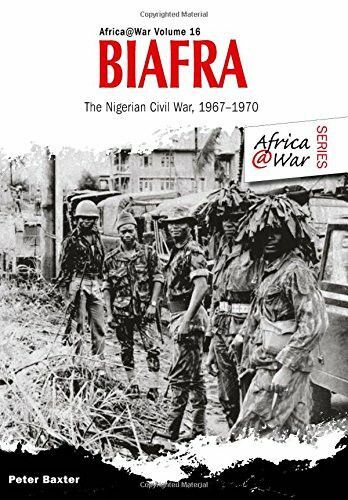 This year marks the 50th anniversary of the Biafra War (1967-1970), a war in which Nigeria's Muslim-dominated military junta crushed the separatist aspirations of the predominantly Christian Igbo. Whilst the Igbo are indigenous to the south-east, they live and work all over Nigeria, excelling in business and administration. On 6 June a coalition of Northern Muslim youth groups warned all Igbo in the North to leave before 1 October or be evicted forcibly. The threat has a precedent -- in 1966 an ethnic cleansing campaign targeting Igbo in the North left some 30,000 Igbo dead and more than 1.3 million displaced. Tensions are soaring once again. Anti-Igbo hate speech is proliferating across the Muslim North. Many fear a crisis is imminent. Please pray for peace in Nigeria and for its Christians. To search both this blog AND Religious Liberty Monitoring together, use the search field at the bottom of the page.